Naomi's Adventure – Page 2 – Your word is a lamp for my feet, a light on my path. Can’t quite believe that I am leaving the wonderful city of Johannesburg in 5 days. That being said I am gearing up for the next stage of my adventure in the Philippines, and can’t wait for all the new experiences I am going to have. Especially as the rain has started in South Africa, time to move on I think! Just to update you all, I have now got all my flights booked (except my one home), but would really value prayer on Visa particulars to be sorted out and finalised. I fly out this Thursday around midday English time so would also appreciate prayer for a smooth flight and no troubles as with the first part of my journey to Jo’burg. I am hoping to write a few more blog posts before I leave, but just want to thank everyone for the incredible support, encouragement and messages, they have all been great! Well on Saturday the 14th I successfully managed to tick off one of the top 5 things on my bucket list. Dal and I decided it would be a great idea to throw ourselves off a small platform suspended in between two 100metre high towers. For years, ever since my Auntie told me she had done a bungee jump, I had wanted the experience of falling through the air (and surviving). So for the morning leading up to when we were going to jump, I wasn’t nervous just excited. In fact even once we had taken the lift all the way up the side of the tower I was still looking forward to the jump. We had paid a little extra to have photos taken when we were up there, which turned out to be a great way of distracting you from looking down and just focusing on the camera. I was the first one of our group to go so thankfully got it over and done with quickly. After walking across the rickety little bridge to the platform I still had managed to not look down. The men up there who hooked you up and did all the safety checks were fantastic. They were so funny and really helped to relax you. Our conversations ranged from Lady Gaga, to why I didn’t have an African husband yet, to what I was doing in South Africa and finally to me being white. This was the funniest part, as everyone got involved in offering their ideas as to which colour my skin turned depending on how I was feeling. For example if I’m cold my skin is blue, if I’m embarrassed my skin goes red, if I’m ill it can go green and so on and so forth. It was so funny in fact, that when they said “Ok stand up you can jump now” it hit me what I was about to do and I froze. Thankfully they already were helping me move forward, as they make you close your eyes before you get to the edge, and my body seemed to go into automatic. It was a moment of matter over mind as my brain was screaming at me that this was insanity, yet I felt my toes poke over the edge and my arms stretch out in front of me into nothing ready to fall. I think I uttered a few pathetic sentences of ‘no wait’ and ‘I don’t think I can do this’ and then they shouted their signature sentence of ‘ONE, TWO, THREE, BUNGEE!’ I felt them let go of my arms and without even giving myself time to protest I let my body fall forwards head first and gravity took over. I can safely say now that the feeling of falling without anything holding you back is the most terrifying and exhilarating feeling I have ever experienced. Everything in your body moves down towards your head, and even though I was well aware that I was going to spring back up, my body instinctively began to uncontrollably shake. I kept my eyes closed until I felt the tightening around my ankles, the sudden jerk of being pulled back up, and then I opened my eyes. What a view, everything laid out beneath you and nothing to block the sight. Then again the bungee rope went slack and I went shooting back down towards earth. This happened a few times and by the time I was used to it it was time to be lowered to the guys waiting below. Feeling hands grabbing me and being laid on the ground was wonderful. Admittedly I felt sick for about 2 hours after, but what an experience. Not only proving to myself that I could do it (and that I have excellent bladder control) but after the initial shock of falling it almost feels like floating through the air, before all the blood rushes to your head and you think it might explode. I am now the proud owner of a certificate which confirms I have completed the Soweto Towers Bungee Jump, and despite all the horror stories I was so kindly told before I jumped, my health has never been better. A few weekends ago, I happened to be off work on the right day. A South African lady, who I have mentioned before, who volunteers in her free time at Door of Hope, was taking part in a swimming race at a dam. She offered to take anyone who was off with her on the 2 and a half hour drive north of Jo’burg. As the dam is at a very large and fancy resort with 4 hotels, one of which has a water park. Once we got over the 4:45am start, Tania, Del and I couldn’t wait to go, see her race and then spend the day lying on a fake beach in the sun. Despite a slight detour on the way, we arrived at the resort in good time. After being bussed to the hotel which the dam was attached to, we walked through the main lobby to be presented with what I can only describe as what food heaven must look like. Every type of breakfast or brunch delicacy that you could wish for was laid before us on numerous white tables shining like beacons of joy. Let us pause and bare two things in mind. Number 1) None of us had eaten more than a stale cinnamon bun since 6:30pm the previous night 2) for those of you who are not aware of this side to my personality, my love of food is in my top 3 big loves, after only God and family. Perhaps now you can understand the reason for the intensity with which I describe the glorious scene of food which was before us. Heart wrenchingly we took ourselves away from the buffet, helped our friend get ready for her race, watched her set off and then realised in was 9:40 and the buffet would still be going. After returning, we paid and joyfully entered the wondrous kingdom of never ending breakfast. This is where we take a moment to savour how well everything was going, until our food paradise came crashing down. The perfection began to crumble as soon as the waitress uttered the words ‘Just wait to be seated.’ Now this in itself was no trial, I had waited enough time already to be more than happy to wait a little longer for my heavenly breakfast. Less than 3 minutes were spent waiting and the women informed us that there was a table available. We were asked to walk to the other end of the dining space where another waitress would seat us. Again, not a problem as we were able to walk past all the wondrous food and plan what we were going to have for our first, second and third course. Imagine then our horror as we reached the waitress and were not only led away from the food, but actually led out of its sight. Perplexed and bemused we were taken around a corner, past some construction work, down a flight of stairs, around another corner, and brought to what I can best describe as either the knock of version of the heavenly upstairs buffet or the place they brought people to eat who they decided they didn’t like. A sea of unoccupied tables lay before us, most only partially laid, with no more than 10-15 people dotted around the large space. Seated at a table which was missing cutlery and cups we were informed that the dark area behind us, up against the wall, was where we would find our food. Quite a contrast from the white and shining food beacons we had previously seen. We were also informed tea and coffee would be brought to us at our table so not to worry about trying to find it. After gathering our missing cutlery from other tables around us, we braced ourselves and went up to get our much needed food. To our dismay we were not the only hungry residents who were attending this buffet breakfast. On the far left we had mini pastries, bread rolls and condiments. In the middle we had an omelette/various types of eggs station and a plate with a lot of pancakes on it. Continuing on came silver dishes containing various types of fish stews, curries, potatoes, tomatoes, sausages and bacon. Finally we arrived at the fruit, all sliced and waiting to be eaten. How delightful you might say, what a spread, everything you could wish for and yes I agree this would have been a breakfast fit for a king. However, this lovely spread was served with a splash of wasp, a dot of fly, a sprinkling of ant or à la insect we could not name. Still tempted? Well irrespective of this we picked around the insects, got some freshly cooked egg concoctions, pancakes with honey and various other things. Famished we returned to our table. Soon the previous problems were forgotten as we tucked in to our much needed breakfast. Not 5 minutes had gone by before the next attack was unleashed on us. Eager to eat my warm pancakes I opened my little honey packet and poured it over. One pancake down I briefly paused to take a sip of my water (the only beverage we could get which wasn’t also being occupied by wasps) and no sooner had I taken my eye off my honeyed pancake, than a fat old wasp landed right on it. Naturally my instant reaction was to swipe whatever was on my pancake off, until I realised it was a wasp. My next reaction was to shoot my chair back significantly from the table as Tania attempted to dislodge it with her napkin. I may as well have put up a sign saying ‘Honey available, wasps land here’. What followed was a hysterical, exhausting and indigestion filled 20 minutes of wasp battling. Napkins, knives, phones, hands, plates and cups were all used in the attempt to rid our table of the wasp attack. When we finally removed the wasp from my pancake, I proceeded to shove the whole thing in to my mouth in an attempt to remove the source of the wasps’ attention. The honey packet, the honey on my plate and now the honey on my lips, were however still just as good a source. Jumping up from the table, ducking, shouting, laughing, throwing ourselves around and even carrying the empty honey pot over to another table (with 3 wasps attached to it) was the spectacle which other diners and staff witnessed. I don’t know whether you are familiar with the term ‘cut the head off the snake and the body dies’ when it comes to battles, however the inference is that if you get rid of the leader the rest of the army will fall. Well we unintentionally did that. In a final act of desperation, Tania whipped her napkin through the air catching a wasp and then launched it onto the opposite table. We waited a moment in terror for a very angry wasp to emerge from the napkin, but no wasp came. We waited and still there was no movement. Almost as suddenly as they had come the wasps left. After our near death experience we decided life was too short to not get the food we originally saw in the previous dining area. So we walked back to the previous buffet, filled our plates (not a single spot of honey in sight) and returned to our table to try and enjoy the little bit of time we had left to eat. As we finished our food and got ready to leave, we suddenly realised we had never gotten our tea or coffee brought to our table. After we asked for it and got it, let’s just say I really wished we hadn’t. Our breakfast goes down as the most hilarious and traumatic breakfast I have ever had. Despite the insects and not eating where we hoped, we still gratefully ate our fill and started what turned out to be a fantastic day with more laughs than I’ve had in ages. Today one of our gorgeous ‘Big Baby’ boys turned a shiny 1 year old! 1 year ago today, a mother gave birth and decided for whatever reason that she could not keep her little boy. I will not be able to understand what she must have gone through to give him up, and it is not my job to comment or pass judgement on her decision. However, I can say now how miraculous and wonderful it is that this little boy had 14 Mummy’s cuddling, kissing and fussing over him on his 1st birthday, not to mention all the other people who were there too. As the home mainly depends on donations, parties tend to be for more than just one child at a time. The one that occurred just before I arrived was for 3 children who all had birthdays around the same day. 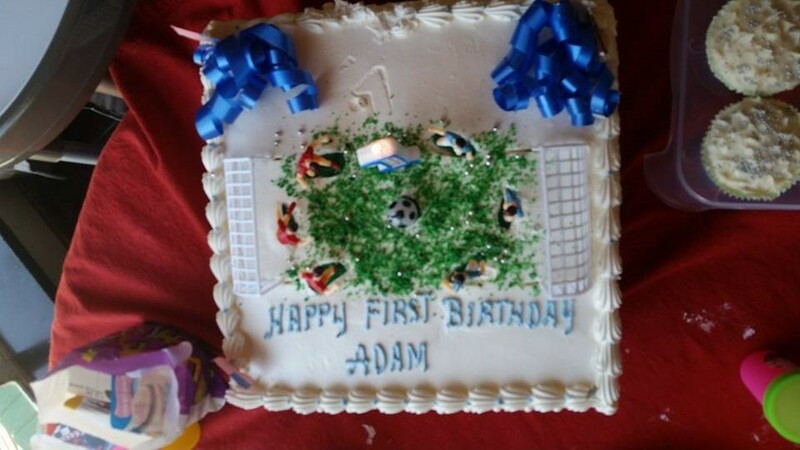 However, today a company came in with the biggest birthday cake I have ever seen just for our little man, with football goals and plastic football players all over it. It even rivalled some of my Winnie the Pooh cakes from previous birthdays. They had party hats, crisps, party bags, cupcakes, fizzy drinks for the adults, party whistles and a big number 1 candle. Their generosity meant that there was enough food and cake for the older Big Babies to have, the toddlers to have, and for the staff to have too, with some left over! Admittedly the birthday boy was fairly overwhelmed with all the people and noise, and sat in his high chair looking like someone was putting him through the worst experience of his life. However, for the moments where he smiled, or laughed, or smeared icing all over his face, or tried to bite the head off one of his footballers, it made all the effort and generosity that had gone into JUST HIS party, so worth it. He almost certainly won’t remember his party, but that in no way takes away from the incredible gift that it was for him to have one. For people to provide one, for us to be able to share it with him and for him to be alive, happy, healthy and to know in later life that he was so loved for it, is the most important and precious thing.